I love it when old sightings which have lain dormant and hidden for years if not decades come to light. This is a theme that has recurred on this blog for years as old archives in paper, microfilm and digital form are searched for these little gems. However, this time the credit goes to another researcher for finding this one from 1925. That goes to Rob Cornes who found the information whilst researching his forthcoming book on the long necked pinniped theory of aquatic cryptids. That book will be co-authored with Gary Cunningham and will be published by CFZ and you can find out more about their findings here. One Bo’ness man, Robert Henderson, claims to have seen the Loch Ness Monster nine years ago. He was motoring with Mr James Paterson, printer, Bank Street, Inverness, from Inverness to Drumnadrochit. About two miles from the village the car’s headlights showed the monster crossing the road. According to Mr Henderson, it resembled a seal in general appearance, but much larger. There was something on its large, rounded, humped back which looked like wings. Suddenly it raised its head, gave a throaty cry, and bounded on its flippers off the road and into the loch. Mr Henderson then noticed that it was about twenty feet long, with a tail like a crocodile. He was amazed at its agility. Thinking that people would only laugh at them, Mr Henderson and his friend did not tell anybody at the time that they had seen monster. But then, these were not the days of monsters! To-day, they are as common as peas, and difficult to catch. Digging deeper into the newspaper archives revealed no further information on this story in any other publication. This is probably a consequence of being printed in a local, low circulation newspaper. However, further searches showed that Robert Henderson was likely the same Robert Henderson who owned a garage which hired out motor vehicles and ran a bus service. It is possible he was driving Mr. Paterson in that capacity on that day, but that is just speculation. In regards to James Paterson, there was a printing business in Inverness run by an Alexander Paterson who died in 1924. Reading his obituary, I would say James Paterson was his son who took over the business. So, these men are real enough, though obviously that doesn't prove they saw a twenty foot creature crossing a road by Loch Ness the following year. Such is the primary source material that we have, how do we assess it? Rob Cornes wondered if this was just a hoax story and one could speculate that since this story came out a month after the similar sounding Arthur Grant land sighting gained worldwide publicity, someone just decided to join the bandwagon. It is easy to take the view that it is more probable that such a story is fabricated rather than truthful. After all, what is more probable? That somebody saw a 20 foot creature cross a road by Loch Ness or that such a story was made up? However, this simplistic use of Occam's Razor would mean that every claim would be dismissed as a hoax. That won't stand up to scrutiny and even sceptics take the less improbable (but still improbable) view that all eyewitnesses who ever claimed to have seen a large creature at Loch Ness have misidentified rather than lied. But there are four checks that can be attempted which can apply in general to claimed sightings which I will list here and apply to this case. The first thing to check is the story itself for internal inconsistencies. That is, are there statements made in the article which are contradictory to other statements made in the article? The more that the story clashes with itself, the less reliance one can place on it. That does not per se mean the story is untrue. For example, some facts can be misremembered and inaccuracies can creep in during the copying process. These do not constitute a reason to doubt the authenticity or sincerity of the witnesses. Each instance has to be judged on its own merits. However, this is a short article and from that point of view, it is not surprising that I found no internal consistencies (though others may wish to chip in). Moving onto what I would class as inconsistencies external to the source material, is there anything we can find about the witnesses which casts doubt upon their integrity as testifiers? In the context of this account, one can only look for circumstantial evidence such as searching said newspaper archives for anything that suggest Henderson was someone not to be trusted (e.g. a publicised court case for criminality). As stated at the top, some facts about the two witnesses were gleaned, but nothing was found that suggested they were people not to be trusted. Again, this would not prove they never saw what they claimed, but it reduces the weight of the report. The next avenue is to look for external consistencies as regards the incident itself. By that I mean statements made which appear to contradict what we know as objective or deductible "facts" concerning the location and environment of the alleged event. Again, it is acknowledged that there are not many statements made in the report, and so there is less opportunity to check them against external facts. To check one aspect of external consistency within the story, the map below shows the rough location of the alleged sighting. Two miles out from Drumnadrochit, assuming there is some degree of rounding up, that would place us perhaps as close as Temple Pier or further north where the slope to the loch gets higher, but not insurmountable, depending where such a creature would be located. Using Google Street View gives us a modern view of the road. However, 1925 was some years before the major improvements made to the A82 road and so what we see in 2017 is not an accurate representation of what these men saw ahead of them 92 years before. Be that as it may, the location is consistent with a creature having access back to loch. What such a creature may have being doing on the other side of the road is again a matter of speculation. But, again, I would say I see no inconsistencies between the report and what we know of the location. One can also pull up an ordnance survey map from that period for a more accurate representation of that time. For that, I reproduce a portion of the OS One Inch "Popular" edition from 1921-1930 courtesy of the National Library of Scotland. I would note the area of the road which becomes more forested (at the "s" of "Ninians"). I would speculate that if a creature was involved, this less open area would be more ideal. This roadside area is less forested on the satellite images on Google Earth, thus showing the advantage of consulting contemporary maps. Finally, the creature described is considered in relation to the external database of Loch Ness Monster reports accrued over the decades and centuries. This is a more subjective approach as the database of eyewitness reports will contain a degree of misidentifications and (to a lesser degree) hoaxes which muddy the waters and warp a clear composite of what the real sightings point to. However, it should still be used to determine how any given single account diverges from the most popular sets of morphologies. Therein may lie a clue as to the report's authenticity. This is obviously not a check conducted by all researchers as some will not believe there is such a cryptid in Loch Ness. Clearly, this particular researcher does adhere to this practise. So, in that respect, is what is described consistent with what has been described before? I would note three levels of correlation, being High, Medium and Low. Those I would class in this account as High would be the features pertaining to twenty foot long, a humped back, seal-like in morphology and flippers. So there is nothing controversial there in terms of what is already recorded. The Medium class is more disputable in the sense that they are not so commonly reported such as the description of agility and a crocodile-like tail. Such a disputation may be due in part to the fact that this is a land sighting where more of the creature is seen and its behaviour will be different to that in water. Agility on land is attested to before (Cruickshank and Grant) but are few and far between as befits the subset of land sighting accounts. The crocodile-like tail would suggest the witness is attempting to describe structures akin to the tail of this much better known creature. This leads us to one problem with witness descriptions when they employ another animal to describe the Loch Ness Monster. 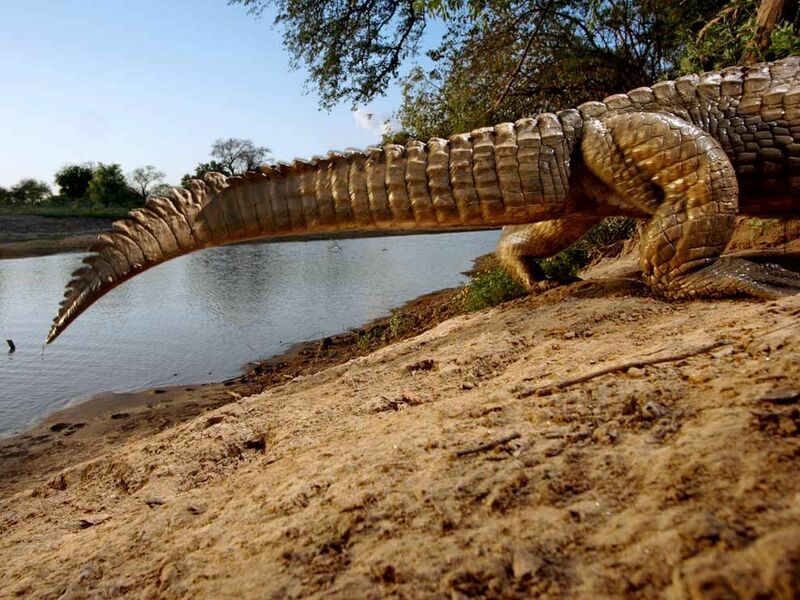 What exactly was it about the tail of this creature that merited the crocodile comparison? 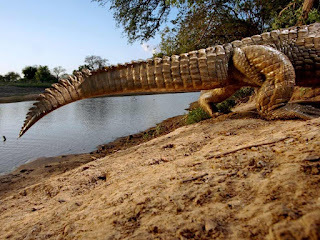 The problem is we do not know what characteristics of a crocodilian tail the witness was thinking of when he said this. Was it the scales, the ridges, the colour, the shape or the length? I would guess it would be something appertaining to scales or ridges, noting that a spinal ridge is often reported on the creature's back and this could be a continuation. I would note in general that since the report says "the car’s headlights showed the monster crossing the road", then it was surely (like most land sightings) a night time occurrence and so the finer details of a creature's appearance may always be questioned in such a circumstance. Finally, there are the Low correlations which rarely, if at all, are noted in the record. These would be the "throaty cry" and "something on its large, rounded, humped back which looked like wings". I looked through the database on the matter of audible sounds accompanying eyewitness reports and they are indeed thin on the ground. But what we have ranges from snorting, gargling, barking, breathing like a horse to sounding like a walrus. Where does a "throaty cry" fit into that spectrum? The problem (as with the tail) is what did Mr. Henderson intend us to think by this phrase? If you gathered a group of people together in one room and asked them to make a throaty cry, you may get a different sound from each person! However, the feature that caught my eye most was this strange description of something looking like "wings" on the back. What on earth did he mean by that? I wish we had a sketch of what was seen! I don't think for a second that Mr. Henderson thought he saw a dragon crossing that road over ninety years ago. What he appears to be talking about are flap like appendages on the back. One may think when "wings" is mentioned, we may have a unique feature which calls the account into question if it has no precedence in the testimony database. But, I think one other land sighting describe a similar thing. That is the George Spicer account and the sketch below show what could be interpreted as similar flap like structure. In other words, I would interpret such an appendage as something akin to a dorsal fin. Having analysed this rediscovered report, I see no reason to doubt the sincerity of Robert Henderson. What he actually saw on the dark, car-lit night is another matter. One may doubt it purely on the fantastical nature of the account, but that goes with the territory in the domain of cryptids. Some may wish to to focus on the words "resembled a seal" in the primary source and class this as a misidentified seal,. That would mean changing the data to fit the theory, but it is clear (to me) that there are things about this creature which are pretty un-seal like. I won't tell the reader what he or she should believe concerning this story. I do not claim to be the last word on interpreting Loch Ness Monster accounts (though others may say or act as if they are). Read my words, consider and weigh them and other comments in the balance of your own mind and come to your own opinion.